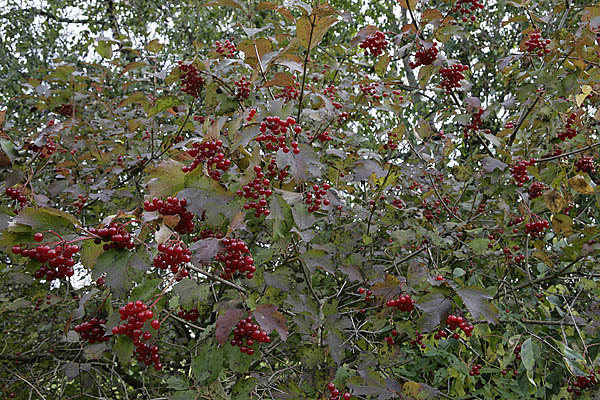 In autumn all fruit-bearing bushes and trees catch our attention but the guelder rose is a real beauty. The guelder rose is found nearly everywhere in Estonia but nowhere in great numbers. Best places to find it are fresh broadleaf forests, wooded meadows or the banks of water bodies. 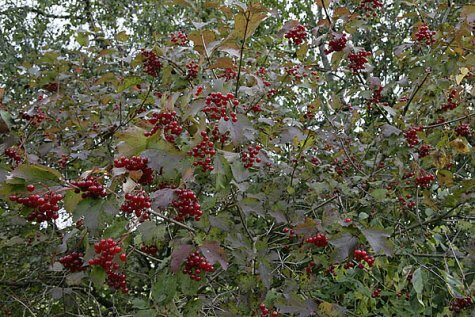 The guelder rose is mostly a shrub, growing around four metres high, and is counted as long-lived, up to fifty years. The leaves are similar to maple leaves, but three-lobed, and coloured from violet to flame red. In the cities a yellow-leaved variety is used as an ornamental bush. Seen from a distance the berries remind of rowan clusters. The fruit contains a large, flat seed – thus a drupe, with a somewhat insipid taste but after night frosts (and they are coming) quite edible. From the sugar- and vitamin-rich fruits a splendid tea can be made, with a really amazing taste.